Active ingredients: diosminum, hesperidinum; 1 tablet contains: the amount of flavonoid fractions 500 mg: diosmin in recalculation on 100% substance 450 mg; hesperidin in recalculation on 100% substance 50 mg. Excipients: microcrystalline cellulose, co-povidon, colloidal anhydrous silica, croscarmellose sodium, magnesium stearate; shell structure: Opadry II pink (titanium dioxide (E 171), talc, iron oxide yellow (E 172), iron oxide red (E 172), polyethylene glycol (macrogol) 4000, polyvinyl alcohol). Tablets, film-coated. 10 tablets in a blister, 3 or 6 blisters in the pack. Symptomatic treatment veno-lymphatic failure (heaviness in the legs, pain, swelling). Symptomatic treatment of hemorrhoids. For oral administration. Using an adult. 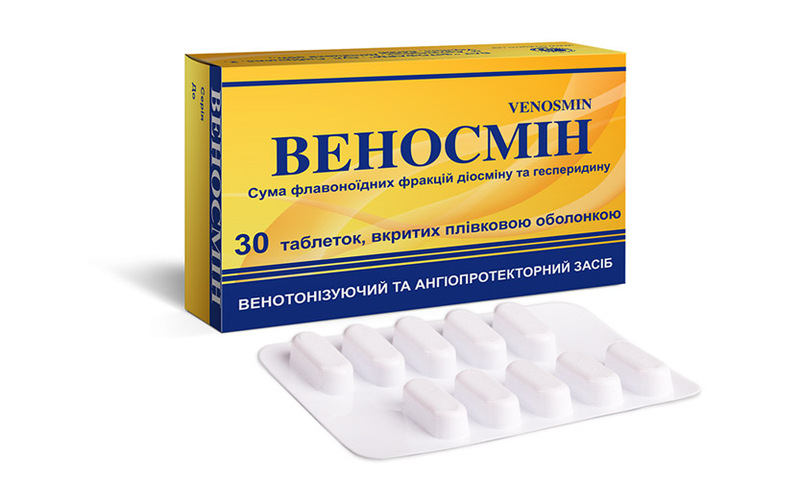 Veno-lymphatic treatment failure (symptoms: swelling, pain, heaviness in the legs, night cramps, trophic ulcers, lymphedema): 2 tablets per day (in two stages), with meals. After 1 week, the application can take 2 tablets once a day with meals. Chronic hemorrhoids: 2 tablets per day (in two stages), with meals. After a week of use can take 2 tablets once a day with meals. Acute hemorrhoids: 6 tablets per day for the first 4 days and 4 tablets per day for the next 3 days. Apply meals. The daily number of tablets divided into 2-3 doses. The course of treatment. The duration of treatment depends on the indications and disease. The average duration of treatment is 2-3 months.